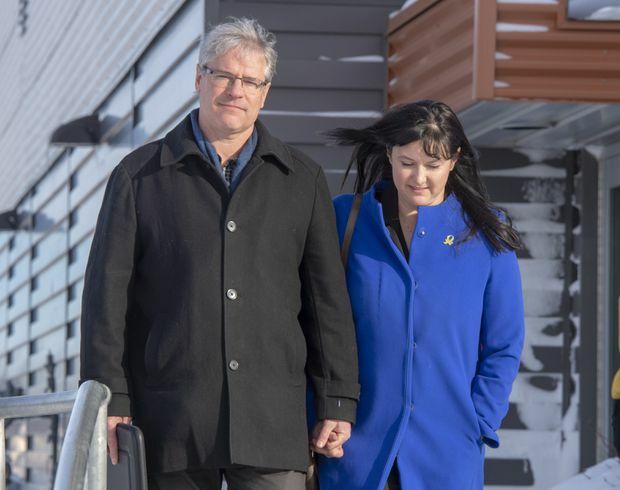 Paul and Tanya LaBelle addressed court on Wednesday, the third day of sentencing hearings for the Humboldt crash driver. Paul LaBelle and his family were pitched into a nightmare in the wake of the Humboldt Broncos bus crash, one where first they were told their son could not be found, then that he was dead, and then, two days later, that he had survived the crash, sustained horrible injuries and was in intensive care. Before hearing that he was still alive, they had already begun to plan the funeral for their 19-year-old son, Xavier. The LaBelle family had to endure days of grief prior to being reunited with Xavier, whose injuries left him unrecognizable. An emergency-room doctor who sometimes tends to patients in air ambulances, Mr. LaBelle, his wife, Tanya, and his nine-year-old daughter, Viviana, were driving to the Broncos hockey game last year when they came upon the scene of the crash shortly after it happened. He grabbed a medical bag from his vehicle and ran toward the wreckage, frantically searching for his son. “Nothing can prepare a parent for the heart-wrenching carnage that was before me,” he said in the statement. Mr. LaBelle wanted to help the dying and wounded, but was dissuaded by an RCMP officer who saw that he was distressed. The Mountie suggested that he and his family join others who were awaiting news in a church about 30 kilometres away. They were told that no survivors remained at the scene. “The reflection on how this has impacted us required us to go backward on a journey of healing to the darkest days, weeks and months of our lives,” Mr. LaBelle said as he began to address the court. Ninety victim-impact statements have been entered as part of the proceedings, which were moved to a gymnasium to accommodate a large turnout by family members and loved ones of the victims. The hearing continues Thursday with closing statements by the Crown and defence lawyers. The memorial for the Humboldt Broncos hockey team is seen on Jan. 30, 2019 in Tisdale, Saskatchewan. Mr. Sidhu, 30, has already pleaded guilty to 16 counts of dangerous driving causing death and 13 counts of dangerous driving causing bodily harm. The maximum penalty he can receive is 14 years. The sentencing date has yet to be determined. A Saskatchewan government report filed in conjunction with Mr. Sidhu’s case shows he had 70 violations of federal and provincial trucking regulations in the 11 days prior to the crash. The crash occurred as the Junior-A-level Broncos were on their way to a playoff game in Nipawin, about a two-hour drive from Humboldt. According to an agreed statement of facts, the semi-tractor-trailer that Mr. Sidhu was driving ran through a stop sign at the intersection of Highways 35 and 335 and then collided with the bus carrying the team. 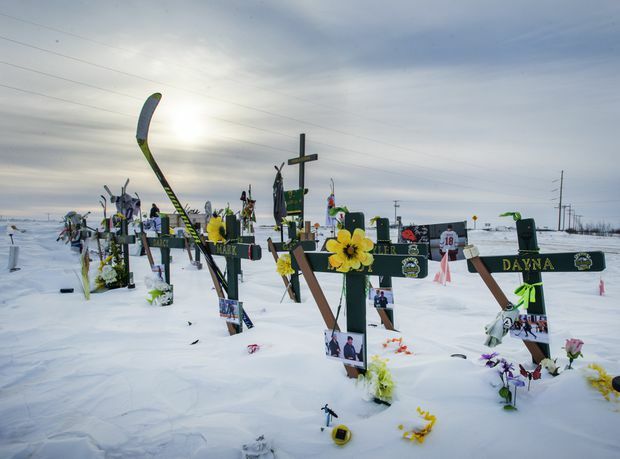 The dead included 10 hockey players, between the ages of 16 and 21, two coaches, the athletic therapist, a broadcaster, the bus driver and a high-school student on a job-shadowing assignment as a statistician. Two of the players who survived are paralyzed, another remains in hospital with a head injury. The LaBelles waited for news at the church for three hours before they were told Xavier was not among the survivors brought to a hospital. They were sent home and told to wait for a call from the coroner. The following afternoon they went to a funeral home in Saskatoon to identify Xavier’s body. The coroner’s office was using it as a staging area because there were so many victims. The LaBelles were escorted in to see one dead boy, and then another. The injuries were gruesome, but they were sure neither was Xavier. They were confused and anxious at not being able to find him, even as authorities assured them that all 29 passengers were accounted for. They rushed to the hospital to search for him, and then returned to the funeral home to view bodies again. Although there were discrepancies, they became resigned that one body was Xavier. They went home and began to plan a funeral. The families of Xavier’s two billet brothers − Logan Hunter and Adam Herold − were planning their own. Paul and Tanya LaBelle were at a community memorial service in Humboldt two nights later when they were called and told a mistake had been made. Xavier had been misidentified as dead, but instead was in the intensive-care unit in Saskatoon. When they had visited the hospital and searched for him, he was 15 metres away and they never knew it. Elated, they rushed to Xavier’s bedside, and then were confronted by another tragedy that is unthinkable. For two days, the parents of one of his teammates had stood over Xavier’s bedside, believing the teenager with a similar build and hair colour was their own son. It turned out that Parker Tobin had been mistakenly identified as that survivor. The 18-year-old from Stony Plain, Alta., had died in the crash. “There was unspeakable joy and yet our grief continued,” Ms. LaBelle said in the victim-impact statement. “We met with the beautiful family that had been keeping vigil by Xavier’s side. We know they cared for him as a son, and are forever grateful. We grieved with them as they came to terms with realizing their amazing son had not survived. Xavier spent 62 days in the hospital recovering from his injuries. He had 20 broken bones, including a fractured skull, facial fractures, fractured ribs, a fractured scapula and 16 fractures along his spine. X-rays have since showed that a spinal fusion failed. His family has consulted with doctors at the Mayo Clinic in Rochester, Minn., and is considering another operation. Xavier was 6 foot 3 at the time of the accident and is now 6 foot 1 because of the spinal injury. The family may never recover from the emotional damage that has occurred: Xavier’s siblings cried hysterically when told he had died; his grandparents later heard him yell out in pain in the hospital as X-rays were taken. Paul LaBelle had to endure listening to his heavily sedated son scream in confused agony on and off for the first two weeks.